Khargo: Furniture and Design: Spring into Khargo! Spring has sprung! 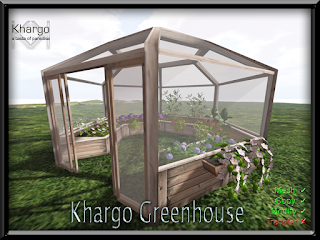 At Khargo we are working hard getting ready for Spring with a new store and a new release! Khargo has moved to a new space at Yellowstone Falls and to celebrate this we are releasing our Khargo greenhouse for My 60L Secret this weekend. An ideal addition to your garden as a growing space or as a summer house to relax among the flowers in. Find it on the Marketplace or at our new Main Store in world this weekend for the special price of 60L - normal price 145L.